Tony spent an entire semester developing a fake HR system, “just to throw it all away at the end of the class.” That experience inspired him to build computer science curriculum around solving real-world problem such as increasing crop yields and streamlining systems administration. 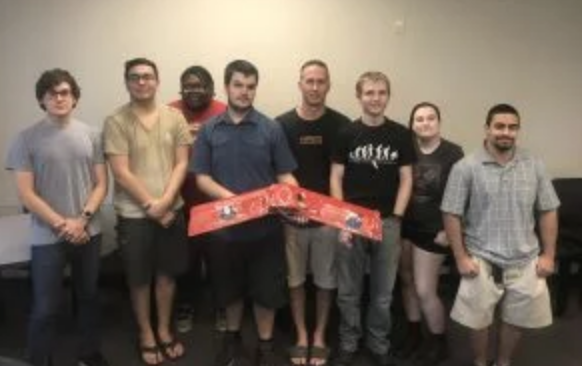 UAT student Brandon Nay (far left) poses with the rest of the UAT Space Exploration crew. For example, Advancing Computer Science and Artificial Intelligence student Brandon Nay didn’t have room for the UAT Space Exploration class on his schedule this semester, but he stayed up all night tweaking on-board electronics before a recent stratospheric balloon launch, developed a data graph twitch stream for the next launch and mentored elementary students in the K-12 program anyways. Students in Professor Jay Carpenter’s class develop blockchain solutions for real-world problems. They also attend conferences with him and network with professionals at the Desert Blockchain Meetup he hosts on campus. Advancing Computer Science Professor Stephen Gose. Professor Stephen Gose integrates music into his Introduction to Python class, which Game Design student Kevin Albregard described as “less of a lecture and more of an immersive experience.” Professor Gose purposefully makes mistakes during class to test students. “When you catch him in the act, you feel this adrenaline rush and morale boost,” Kevin said. READ: The Lovable Goofball We Call Gose. Students expect engaging, relevant content. They also expect instant feedback and answers to their questions, which is why UAT professors don't hide in private offices or labs. Instead, they sit in the commons area, where they help students with homework and get to know them. Technology will never stop evolving, and neither will UAT computer science curriculum. Professors proactively seek industry feedback, read a lot and spend their free time coding. According to Tony, “Full Stack won’t be Full Stack without AI in a few years.” That’s why UAT continues to reshape our technology curriculum to emphasize artificial intelligence, machine learning, IoT, mobile development and other trends that aren’t going away. If you want to future-proof your career, then check out the Advancing Computer Science degree program at the University of Advancing Technology today.